I have nothing against celebrity chefs but it does get a tad worrying when some get carried away flogging books, TV shows, live appearances, etc. instead of sticking to their actual vocation - that of cooking. Chef Frankie Woo, therefore, I daresay is terribly ‘old school’. This is one Chinese chef that eats, breathes, lives on and even dreams of good food with such deep-seated passion, it is hard not to share his enthusiasm. This lanky, stick-thin veteran chef has been in the business since he was 13 years old. Whether it's a no-frills restaurant or top 5-star hotel outlets, Chef Frankie Woo has worked in them all. Today, he calls the shots at his own restaurant, Gu Yue Tien. Don't be fooled by its low-key existence though - although it is just three years old, Gu Yue Tien often attracts a discerning circle of fine Chinese food connoisseurs including the rich, powerful and famous. So don't be surprised if you spot superstar Jackie Chan or Datuk Michelle Yeoh and her beau at the table next to yours. Did you know that Chef Frankie Woo is one of the few Asian chefs who has had the privilege of being a guest chef in the US of A at the invitation of the prestigious James Beard Foundation in 2004? James Beard is one of America's most respected chefs and his foundation is seen as a guardian of excellent culinary standards for top-notch restaurants and the F&B industry. Every year only a handful of young, talented chefs from all over the world are invited to showcase their culinary prowess at a special 'by invitation only' dinner. "Just how important is it? Well, it's like being invited to do a film with Steven Spielberg or George Lucas!" said Chef Woo. Yes, one can literally talk till the cows come home with Chef Woo once you get him started on the subject of food. His ardent passion and superior knowledge of Chinese cuisine, its origins and intricate links to a rich, primeval cultural legacy are further substantiated by his wealth of experience and skills. This is one chef who is well-versed with the nitty-gritty of cooking up everything and anything under the sun, whether it's wild exotic meat or contemporary Chinese dishes that incorporate the wealth of ingredients sourced from different corners of the world. But one thing is for sure - diners can be assured that his modernistic approach never detracts from their quintessential Chinese essence. For instance, his Double-boiled Pig’s Stomach Soup with Golden Coin Shark’s Fin (RM80++ per bowl) is a masterful blend of humble rusticity and sheer extravagance. Robust and peppery, this timeless home-style soup is transformed into a gastronomic treat thanks to the addition of shark's fin. While the cold appetizer of Smoked Salmon Roll with Crab Meat Salad and Salmon Roe (RM12++) is more Continental than Chinese, you can't help but marvel at the interplay of textures and flavours emanating from the wickedly indulgent creation. 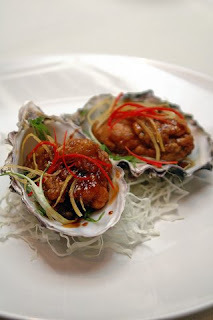 The sublime dressing in the Oven-Baked Fresh Oyster with Honey Glaze and Lemon Dressing (RM14++) does a great job of heightening the mollusks’ inherent sea-fresh sweetness and succulence. Concocted from honey, lemon zest, aged Chinese vinegar and spring onion, it will leave an indelible impression on you long after the dish has been consumed. Like Merlin the Magician, Chef Woo's ‘saucery’ skill once again comes to the fore in the Baked Fresh Water Prawns with Home-made Butter Sauce (RM13++ per piece). 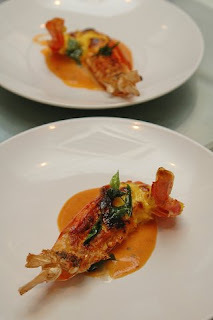 Velvety-smooth and rich, the sauce is superbly aromatic thanks to the curry leaves in it. We also had a chance to savour Steamed Empurau, a highly-prized native fresh water fish (Tor tramboides) from the pristine rivers of Sarawak. Due to its elusiveness and dwindling numbers, the fish which can weigh up to 7-8 kilos, can sometimes command between RM400 and RM800 per kilogramme in the market. Chef Woo said the fish is rich in omega-3 oils as it is fond of feeding on oil palm seeds. "I usually steam it whole with the scales intact to ensure its clear, sweet flavour and fine texture are maintained.” Indeed, the fish has an ethereal melt-in-the-mouth silkiness to it. Its fatty belly area is especially appreciated for its smooth, custardy texture. 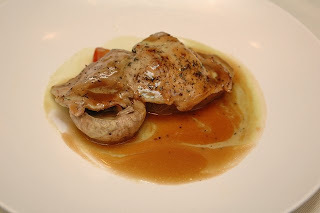 Another signature dish is Braised Black Pig with Mushroom and Radish (RM26++). The pricey pork is known to be unbelievably tender as the black-coated Spanish pigs are raised on a natural diet of grass, herbs, roots and acorns. Having been braised with radish and mushrooms, the fork-tender escalopes are suffused with an enticingly earthy sweetness. If you love soft-boiled eggs, Chef Woo's trademark Half-boiled Egg with Foie Gras (RM8++ each)is a 'must have'. A decadent treat imbued with the indulgent richness of foie gras, the lightly poached egg is served in its shell. Even dessert is slightly off the beaten track – his Bittergourd Pudding with Honeydew (RM8++) stands out for its subtle kum (gold) aftertaste, an astringent bittersweet nuance which is a refreshing counterpoint for this creation. 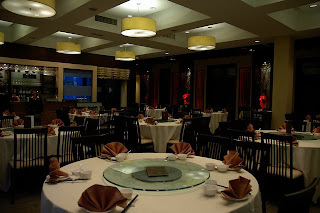 Located at Chulan Square across from The Pavilion Kuala Lumpur, Gu Yue Tien’s understated elegance makes it a favourite amongst corporate types and fine Chinese cuisine lovers. Its discreet, personalised service is further boosted by the owner/chef’s hands-on approach. Expect to pay around RM99++ per person or more when you dine here but some of the signature specialities are worth every sen.